Your tie says everything about you. By its colors, its pattern, its placement, it announces your taste and style to the rest of the world. 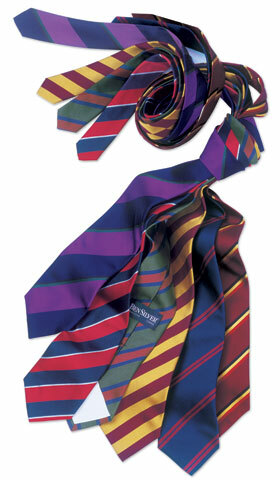 Once, the necktie served the singular purpose of announcing the background of the wearer. A finely made necktie should be in balance with the size of jacket lapels. A necktie should be tied so that there is no collar space showing at the knot. The tip of the tie should end at the belt, not above it. It is thought that the term bow tie comes from the French word jabot, a form of tie in the early days of neckerchiefs. It is always made to be tied, not pre-tied. A bow tie makes a statement of individuality, and nothing contradicts that statement more readily than having it pre-tied. Bows are practical and offer a flash of color nearest the face.